A. Each team will consist of four anglers. An alternate angler may substitute on a daily basis. B. Only one member of a team may be a professional full-time or part-time fresh or salt water fly fishing guide. A professional is defined as anyone who, within the last five years, has received income for services performed as a guide. A. Anglers may bring one or two fly rods and reels of their choice. B. Only floating fly lines are permitted. Sinking leaders of seven feet or less are permitted. Steel leaders are not permitted. C. No fish attractants, such as scents, are permitted. A. Anglers will choose the fly they will use each day. A different fly and a different pattern may be used on each day of the event. B. The competition fly may be no larger in hook gap, nor longer in shank length, than the template shown in the printable rules (image based on a Dai Riki #710, Size 6, with 3x shank). C. Flies must be tied on a single barbless hook, or on a hook with the barb pushed down. Jig hooks are not permitted. E. The guide must approve the angler’s fly selection before 8:30 a.m. If the legality of the fly used during the contest is questioned by the guide, the fly will be brought to the Rules Committee. F. Repair of flies may only be done with the use of adhesive. Any re-tying of the fly with thread or fly-tying materials is prohibited. Broken hooks may be re-sharpened. G. Strike indicators may be no larger than ¾ inch in any dimension. Flies, even those with broken hooks, are not allowed to be used as an indicator. A. Federal and state rules and regulations governing the waters to be fished will be strictly observed. VIOLATION OF WGF REGULATIONS: All anglers must abide by all Wyoming Game and Fish regulations concerning fishing, aquatic invasive species and boating. Any participant found to violate any Game and Fish regulation from 8 a.m. Friday through 4:30 p.m. Sunday will be disqualified. B. Two anglers from different teams will fish in each boat. C. All main river channels are fishable. D. Only trout species will be counted in the scoring. E. Fishing hours on the Snake River will be from 8:30 a.m. until 4:30 p.m. on day 1, and from 8:30 a.m. until 4:00 p.m. on day 2. Fishing hours on the South Fork River for both days will be from 8:30 a.m. until 4:00 p.m. Guides are the official time-keepers and should set a phone alarm to signal the end of the fishing day. F. Only legal BLM, Forest Service, National Park, or One Fly-approved river accesses may be used. A list of allowed accesses will be available to guides at their required meeting before the One Fly. G. Anglers may not float through any stretch of water more than once except that a guide may maneuver a boat upstream to fish a particular run again (for example, by back-rowing). H. Use of motors on boats during event hours is prohibited. I. Anglers may not fish upstream from their assigned put-in (with the exception of South Fork Upper section and the Dam section of the Snake R), nor downstream from their assigned take-out. This applies to both sides of the river. J. The Upper South Fork section will take out at the Spring Creek Bridge. The Middle South Fork section will put in at the Spring Creek Bridge and take out at Eagle. The Lower South Fork will put in at Eagle and take out at Byington. K. An angler’s assigned fishing venue and guide may not be altered. Unless specifically approved in advance by the Rules Committee, any variance from these assignments will disqualify the angler from that day’s fishing. L. With the permission of the fisherman who has a fish “on the line,” the guide or boat partner may assist in landing any fish to be scored in the event. If an angler’s fly becomes caught in brush or in a snag, it may be recovered and reattached to the leader. The angler may continue fishing in the event. The angler can be disqualified by the guide for any unsafe practice used to retrieve a fly. Daily scoring ends for the angler when his contest fly becomes irretrievably lost. That person may continue to fish for the remainder of that day, but no fish caught after the contest fly is lost may be scored. O. Anglers will mutually agree on boat position assignments (front and back) so that each angler spends one half of the fishing day in the front of the boat. If an angler loses his/her fly, he/she has the option to forfeit the obligation to rotate boat positions for the remainder of the day. P. The person in the front of the boat will, within reason, have the choice of boat position, such as right bank vs. left bank, casting distances, or stopping the boat to fish. Q. Anglers must wear (and have fastened) their life vests while fishing or being transported on the river. R. Guides will be furnished daily a Rules Violation Sheet, where the guide will write out any violation, have it signed by a witness (other person in the boat) and must turn the Violation Sheet into the Rules Committee within 2 hours after landing. If the Rules Committee is not physically available, other One Fly Board members, along with a guide representative, may consider the issue at hand. Penalties will vary with the violation, from sanctions, to nullifying daily scores, to disqualification from the event. S. Trout caught from tributary streams which enter the primary river may be scored if the fly is cast no more than 100 ft. upstream into the tributary from the high mark of the natural stream bed of the main river. Any angler fishing in an area inconsistent with the above will be disqualified from the event. T. Any angler repeatedly showing disrespect of his boatmate or guide, by action, language, criticism, or materially interfering with the fishing of his boatmate, shall be warned by the guide of possible disqualification. The guide shall present to the Rules Committee a written summary of the behavior that occurred. The One Fly scoring procedures are designed to reduce the handling of our trout. A. To be counted in the score, the release of a caught trout must be witnessed by the guide. 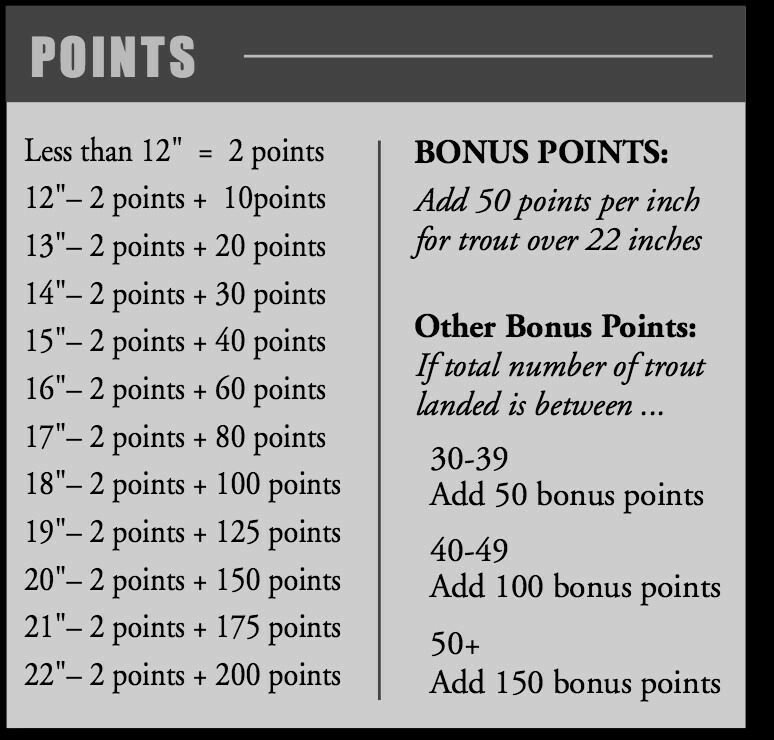 Each of these trout will have a value of two points. If the angler or the guide touches the leader while a fish is “on”, then that fish is counted as two points. B. Each angler will be allowed to select eight (8) trout to measure during the day. Six (6) of these fish will have a bonus score. All trout not selected for measurement will be released immediately, preferably without removing them from the water. C. All trout, including foul hooked trout, are counted unless the angler intentionally foul hooks the fish. It is up to the guide to determine if the fish was foul hooked intentionally. D. Measurement of trout shall be done by the guide while the trout is in the water whenever possible. The guide should measure the trout with the fish placed headfirst into the trough provided to the guide, a Fishscale on the rod or net handle, a ruler, tape measure or like device. Fish are to be measured from the tip of the nose to the tip of the relaxed tail. The tail of the trout should not be pinched. All trout should be measured to the nearest 1/4 inch, to ensure accurate measurements for the biggest fish competition. Measurements should not be rounded up by the guides. In signing the scorecard, the angler understands that this represents only an estimate of their final score. Scores will be finalized by the scoring committee, due to rounding of fish length and/or incorrect addition of total points. F. Twenty-five points will be awarded to an angler each day that angler keeps his competition fly all day. G. A penalty will be assessed for any fish killed or ruled by the guide to be unable to survive.